Home remodelling and design website Houzz featured one of our most stylish bathrooms radiators in their Every Room Needs a Little Bit of Black feature. Bisque Radiators offer a stylish touch to any room and work well against a number of different backgrounds as you can see from the feature, including black! It can change a dimension of a room, turning a boring and monotone room into something far more exciting. You don’t have to go over the top with black accents, try just a ceiling, feature wall or even floor to help make the rest of your room stand out. Bisque Radiators, especially the Bisque Quadrato Towel Radiators which was featured, add a stylish touch to any room. The simple and striking design looks create against a bold colour wall, take inspiration from the image, “Black shines when paired with a magenta wall…”and add a splash of colour to your bathroom, teaming it with black tiles. 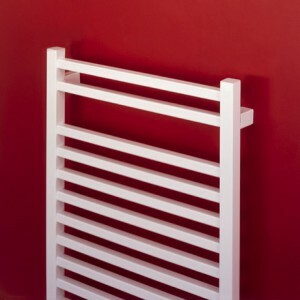 The radiators come in white and chrome and would work well in any modern and stylish bathroom.